Ever since I started my blog, all my friends and relatives have been constantly asking me for sharing this coveted recipe. My Crispy and crunchy Uzhunnu vada has always got much accolades and I am just happy to share the secrets, if you are a vada lover. Well, to start with, when most people use small onions for Uzhunnu vada, I use Big Onions. I was lazy to peel the small ones I guess, but it became instant hit so I never attempted to change my style. The second secret is that I prepare batter two hours before frying and mix all ingredients and keep in the fridge for cooling the batter. Many people have asked me whether I add rice flour or soda powder to get the crispiness. I have never tried those, as I am happy with the crispness and texture of mine. The vada batter should be made with very little water or it will absorb more oil. Uzhunnu Vada is quite filling as a quick snack and with Idli Chutney combo, it is considered a healthy breakfast. Masala Vada, Ulli Vada, Uzhunnu Vada, Potato Croquettes, Samosa, Spring Rolls, Pazhampori, Butter Murukku etc. are all quite popular snacks and ideal for kids parties. You may also check my baked Party snacks like Pizza, Egg Puffs, Sausage rolls, Garlic Bread etc. If you follow the step by step recipe, you will make nice crunchy vadas in no time. Perfecting the shape is not an impossible task; with little practice you will become expert. Try this recipe to make deliciously crispy Uzhunnu Vada. Dedicating this recipe especially to Bellaunty, Anu, Manoj, Vinukuttan and Joby; great admirers of my vada!! Wash and soak Urad dal in water for 1 hour. Chop very finely onion, ginger, green chilies, curry leaves (use a mini chopper if you have one, or chop very finely). 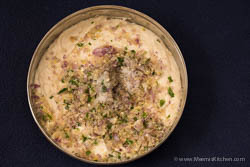 Divide the soaked Urad dal into three or four portions and grind each portion in your small mixie bowl with one cube ice or 1 tbsp cold water (the batter should not be hot) to a smooth paste. Only very little water should be used just to churn the dal. If you need more water, add in drops and grind again. Once you get a smooth paste keep it in a bowl and repeat the process with the rest of the portions. Add the chopped ingredients, small pinch of Pepper powder and salt to the batter and mix well. Cover the bowl and keep refrigerated for 1 hour or more. Heat oil (Rice Bran/ Sun Flower/ Coconut enough to deep fry) in a kadai. When oil is ready wet your hand in water (keep a bowl of water for dipping your hand), take a small portion of the batter in your hand. With your wet thumb poke in the middle of the batter and make a hole. Put this into the hot oil (please take caution here, the distance between your hand and oil should be less, not too less, not too more, to avoid burning or splashing of oil. See the picture.). The oil should remain on high flame throughout. Since it is small in size, it will cook properly so don’t reduce the flame. 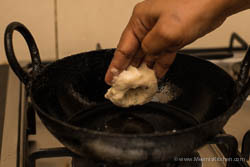 Deep fry the vada till it is golden brown on both sides strain and put in a tissue paper for draining excess oil if any. Finish the batter the same way. 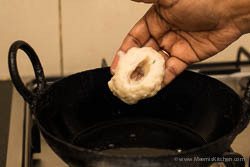 Reduce the flame only when you are straining the vada and put on high flame again when you are putting batter. Grind all the ingredients together with salt and 2 tbsp water to form a coarse chutney. Serve with vadas. There, your much awaited Uzhunnu vada is ready. Have it with vada chutney and hot tea/ coffee. Always use the high flame burner for frying vadas. Do not reduce the flame while you fry the vada. The vada batter should slid from your hand to the oil. For that slightly push the batter with your thumb to oil. With practice, you will see the shape getting better and better. 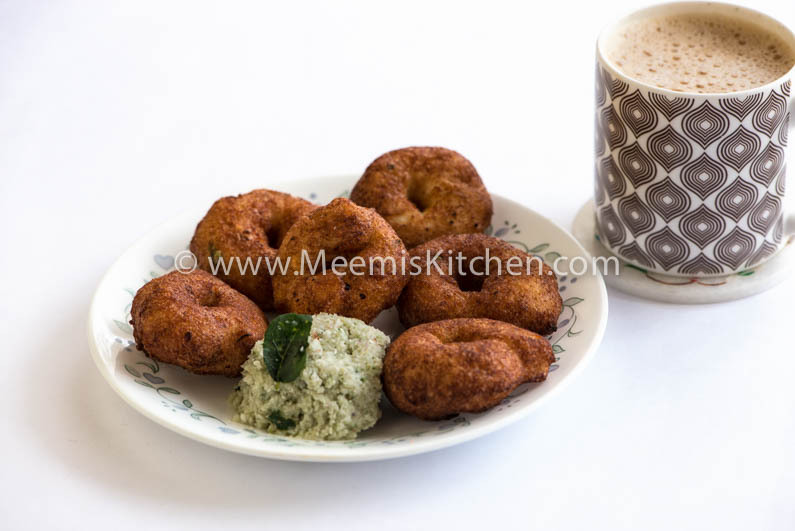 Enjoy the crunchy tasty vadas with your cuppa. God Bless! !